On the way into work earlier this week I passed two of those newspaper billboards on consecutive lamp posts. One read “Rain has not broken the drought”, and the next one read “Floods in KZN”. 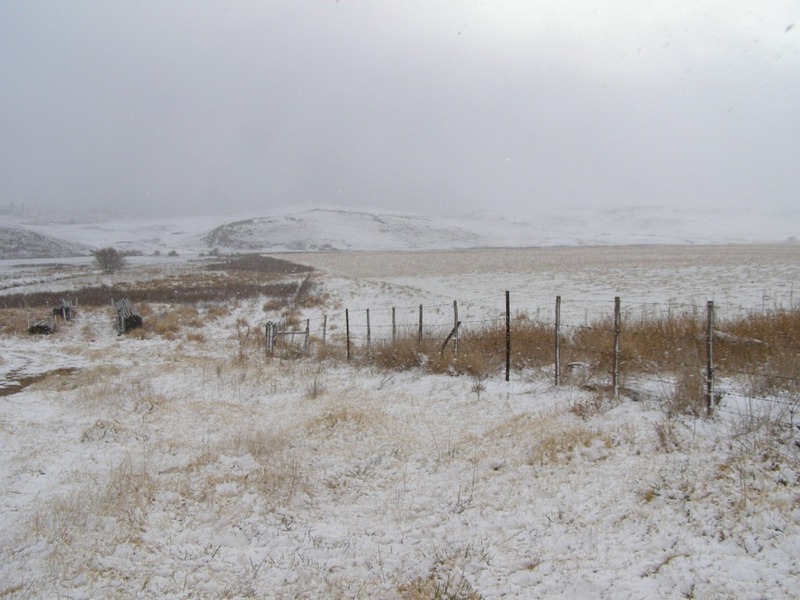 I think it was the same day that the weather forecast predicted severe hail storms in the Free State, and the following day there was a tornado in Jo-burg, and this all followed 2 days of snow in the berg. Today is a lovely sunny day. Expect severe frost tonight. So all in all it is pretty average weather. But at least on the rainfall front, it’s bloody fantastic! We can consider ourselves “over served”…(a delightful excuse for one’s intoxication, that PD passed on to me after a jaunt to fish the Shenandoa National Park for Brook Trout) At 70mm or thereabouts in most of the upland areas of the midlands, and with the Trout streams barreling along, it is just a little intoxicating isn’t it! Maybe…just maybe….this is what we need to turn the fishing around in the coming summer. 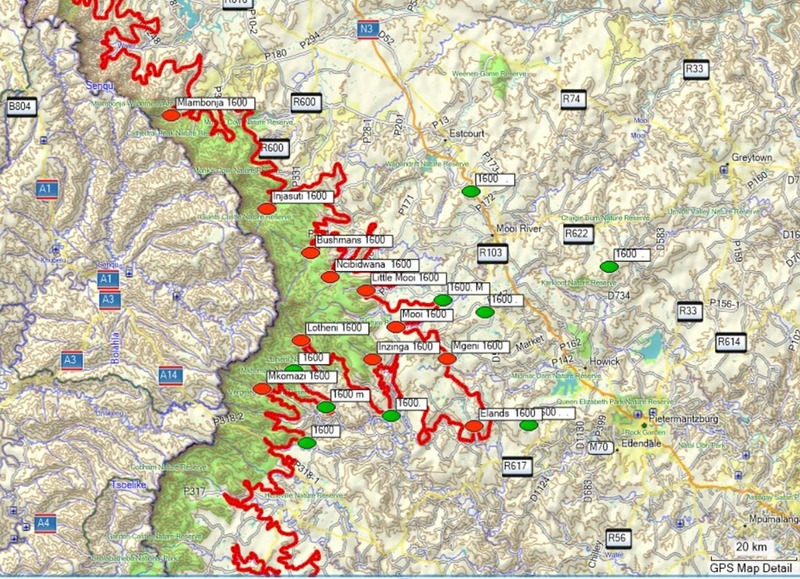 If the fishing results of recent winter tournaments in the Kamberg and Boston, as well as club results, are anything to go by, the fly fishing really has been down on normal years. My own forays have been less successful (in fish number terms) than the average. Now we just need to hope for a spring that starts in September, and not in January as happened last season. I have complete faith that we will have an incredible season in 2016/7, and I don’t know about you, but I plan on being prepared for it all. I have read the two articles in Wayne Stegen’s series on Vagabond Fly Mag, and I am already tying up a few leaders for the spring fishing. Us fishermen, like farmers, are eternal optimists while at the same time, possessing the skill to invent excuses beyond the reach of the common man, when in the end it doesn’t all work out. Maybe that is why I liked the “over-served” excuse so much. It can only have been coined by a fisherman. 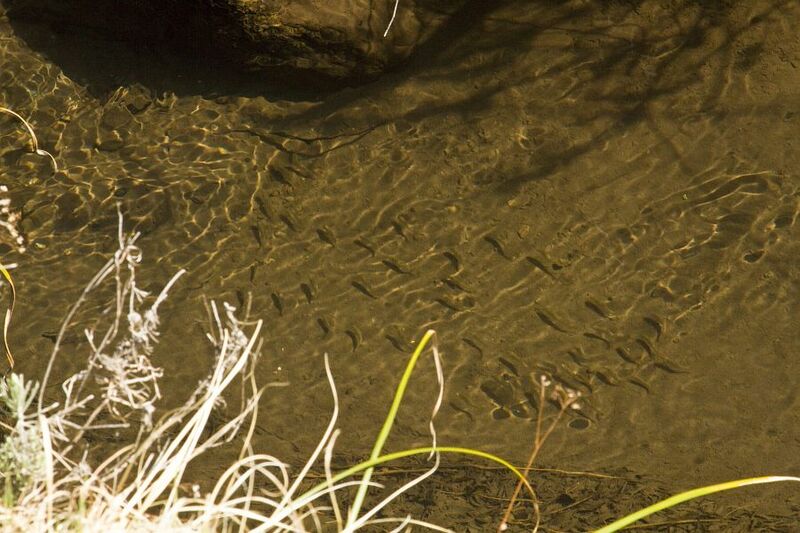 Because Trout and bass are being labeled as “alien invasive” by authorities in South Africa, they are together on the same side of the battle lines. 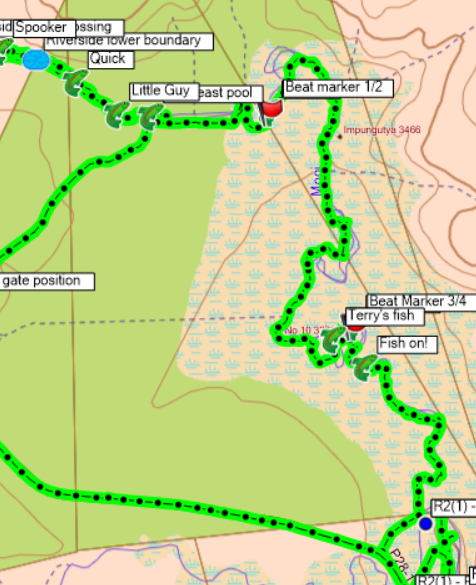 That is perhaps the reason that little is being said by Trout fishermen about the bass problem. But a more likely reason is apathy, or some other failure on the part of us fly-fishermen to galvanise into action. 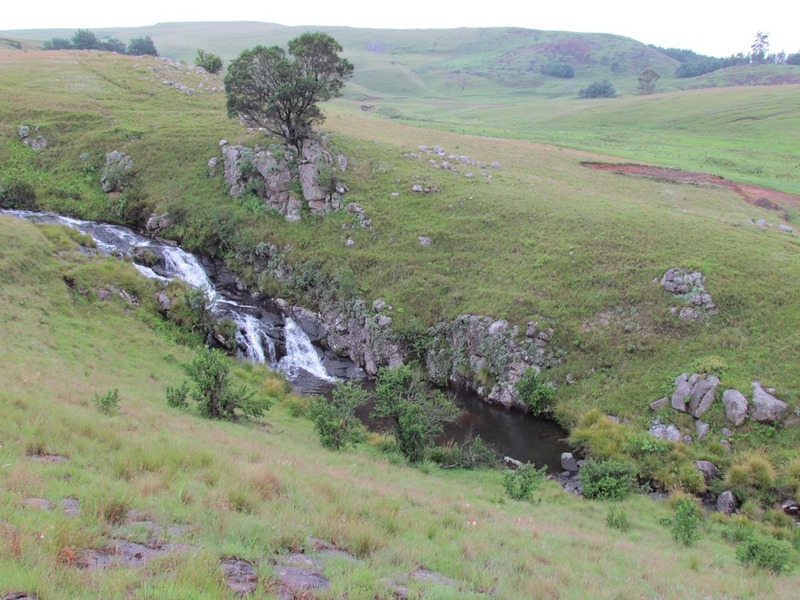 I say that, because the unwanted, unchecked spread of bass in the uplands of KZN has been going on for thirty years. 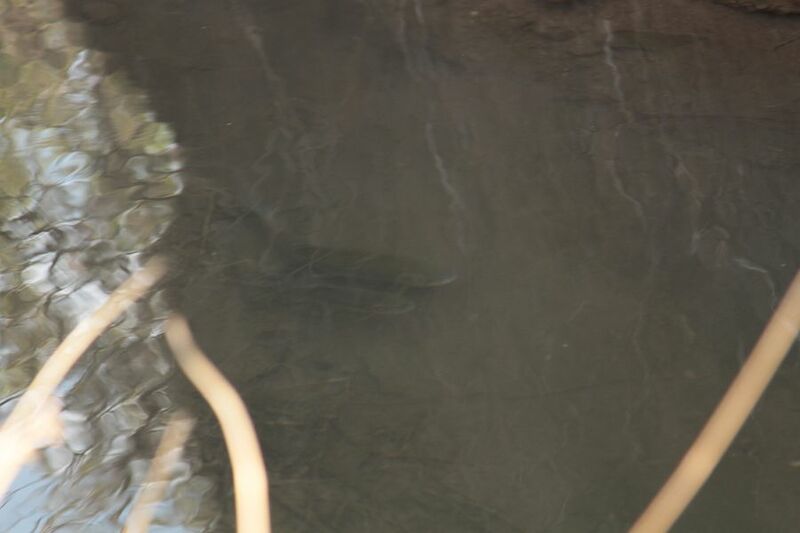 Those, by the way, are 30 years in which Trout have not “invaded” anywhere at all. So why, might you ask, is so much being said about Trout being alien invasive, and NOTHING being said about bass? I don’t know the answer. I can guess that Trout somehow have a colonial connotation about them, but that’s as solid a reason as I can dream up. There is simply no logic to the silence surrounding the problematic spread of bass in our area. So what does the problem look like? 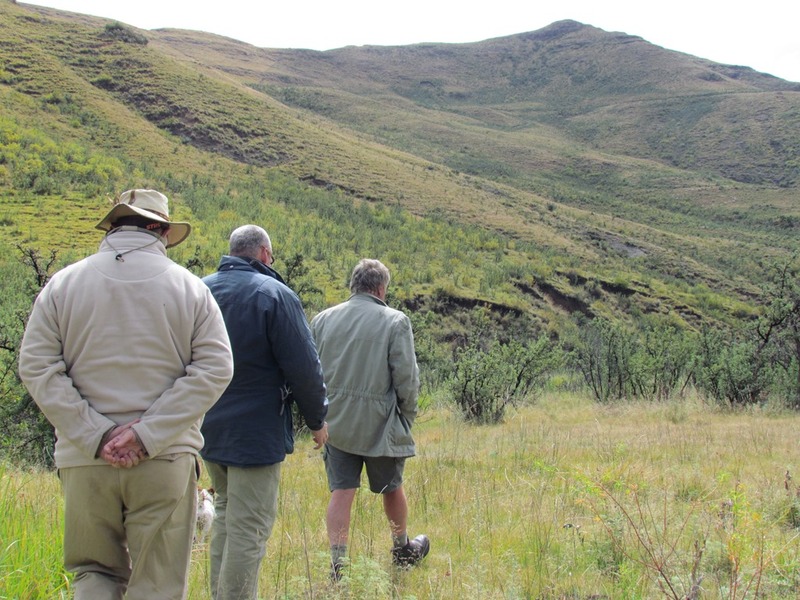 When I was a schoolboy, our family visited the Underberg area on holiday. 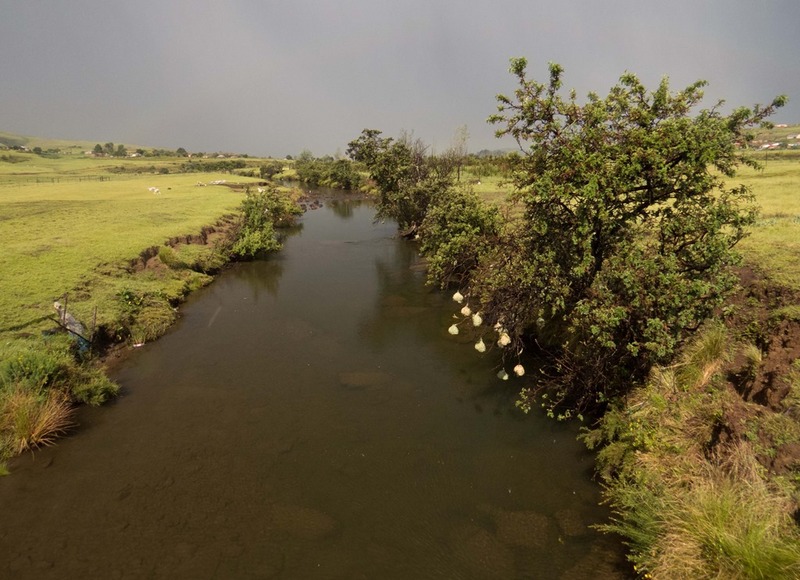 We used to queue each morning at the Underberg Himeville Trout Fishing Club office (UHTFC) to speak to Bill Hughes, and before him Bob Crass, and book water for the day. Some of the waters had bass in them. North End and Palframans spring to mind. There may have been one or two others, but not many more. Now, 30 years later, you struggle to find waters that DON’T have bass in them. Not entirely co-incidentally (and sadly!) , you no longer have to queue outside the offices of UHTFC to book water, and a whole social flyfishing fabric has wasted away. 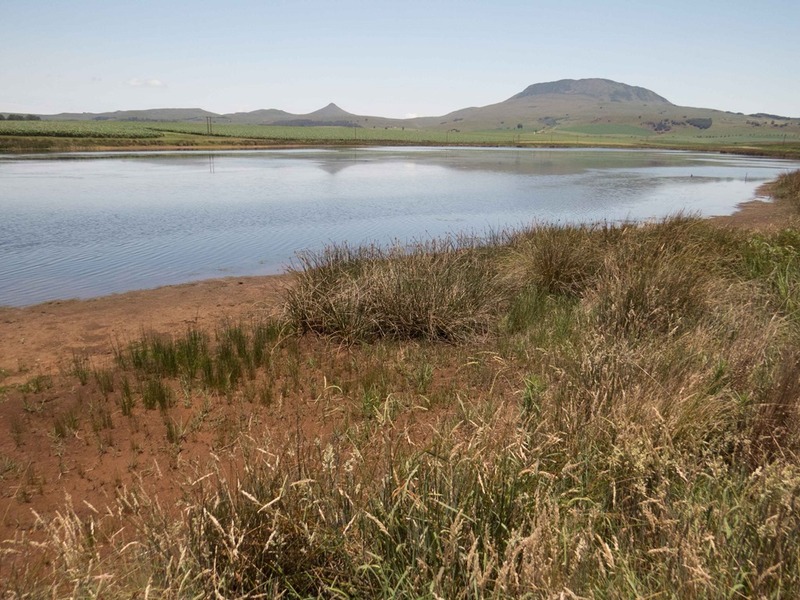 As a varsity student, I remember one dam in the Kamberg that had bass in it: “Morrass vlei”. Windmill; Goose ; Eremia ; Prosperity; the Little Mooi; Sourveldt lower dam; Bracken Waters; Rey estates 2 dams; Airstrip; Meshlyn main dam; and more. 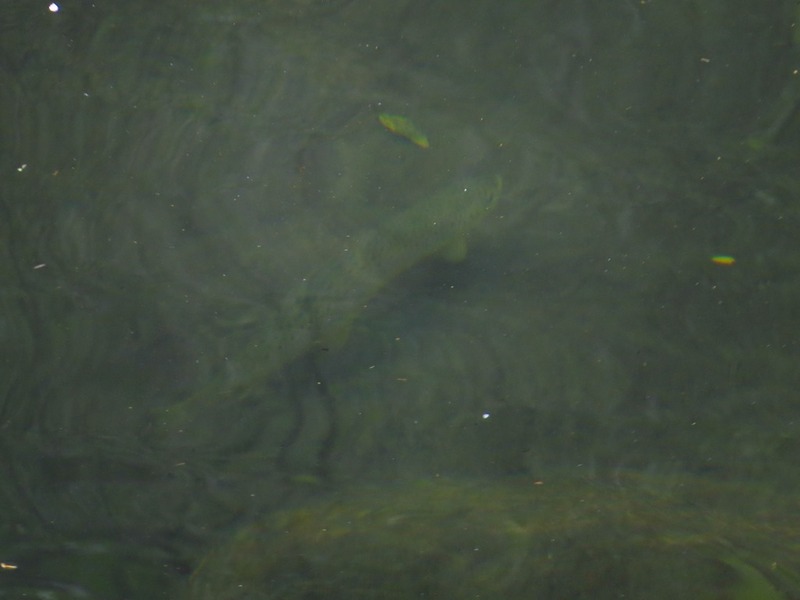 A bass lurks in the shallows of a previously hallowed Trout water. And remember that in this example I am addressing just the Kamberg valley. 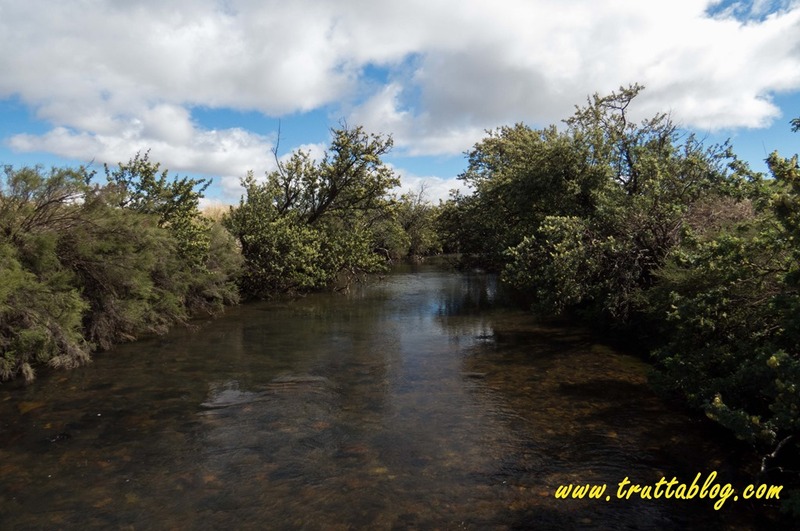 When you start tallying dams throughout KZN the list is enormous, and includes some previously famous and treasured Trout waters. I don’t know about you, but I am horrified! 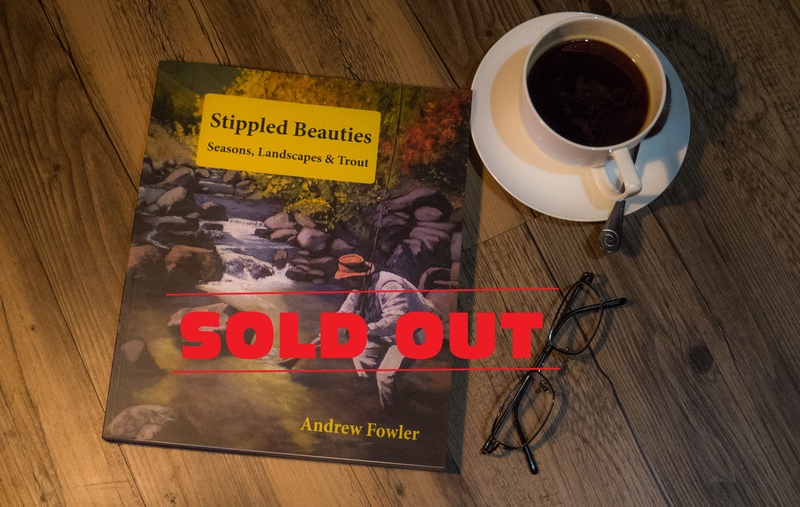 Remember that the Trout don’t breed in these stillwaters and need to be stocked. The bass, on the other hand, breed like crazy, and once they are in there is very little chance you will ever get rid of them. 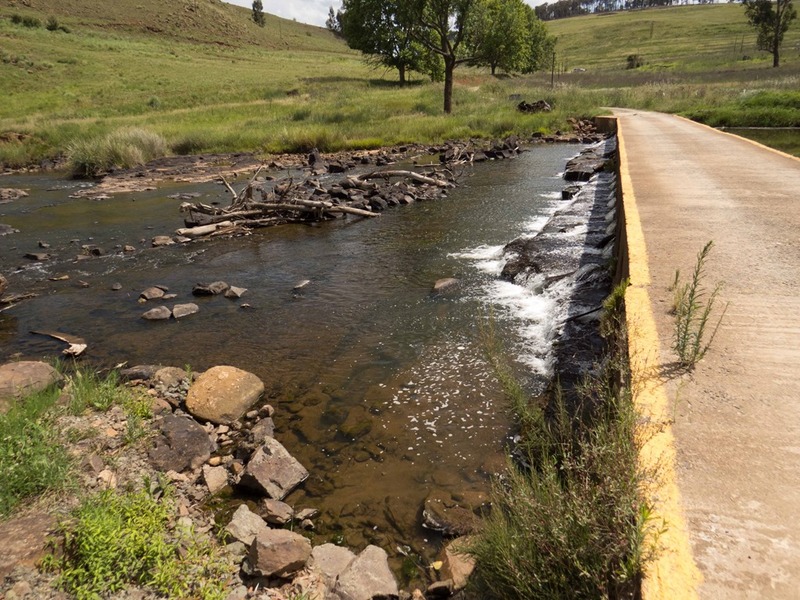 You can empty the dam and poison it, but farmers understandably don’t want to empty their irrigation dams. Poisoning water is also a touchy subject. So why are bass a problem. Why can’t we have bass and Trout in the same water? 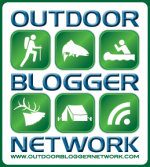 We can, but most flyfishermen I know, go after Trout, and don’t want to be catching bass. Bass almost seem to have a self defense mechanism wherein they breed like crazy in the face of competition. It seems that way, because when they invade a Trout dam, fishermen report catching literally hundreds of bothersome bass, the vast majority of which are tiny. 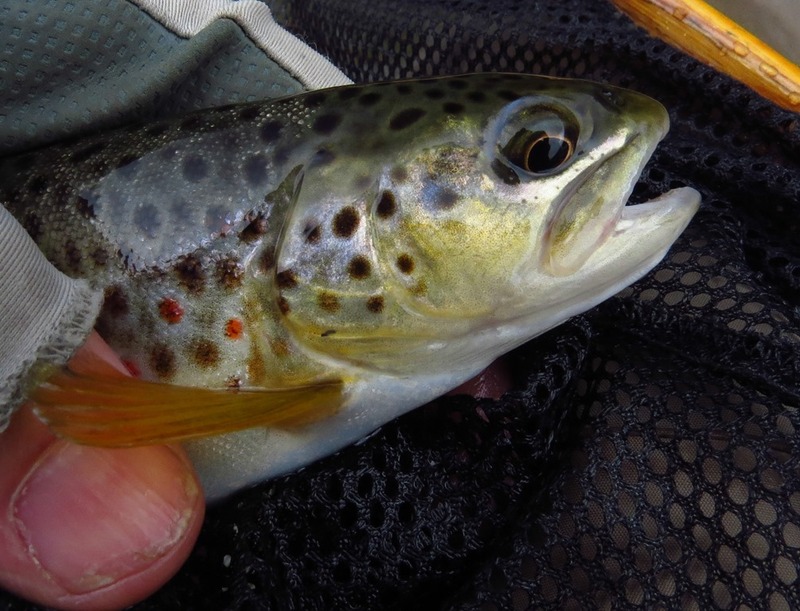 Now Trout eat small bass (and get very fat on them! 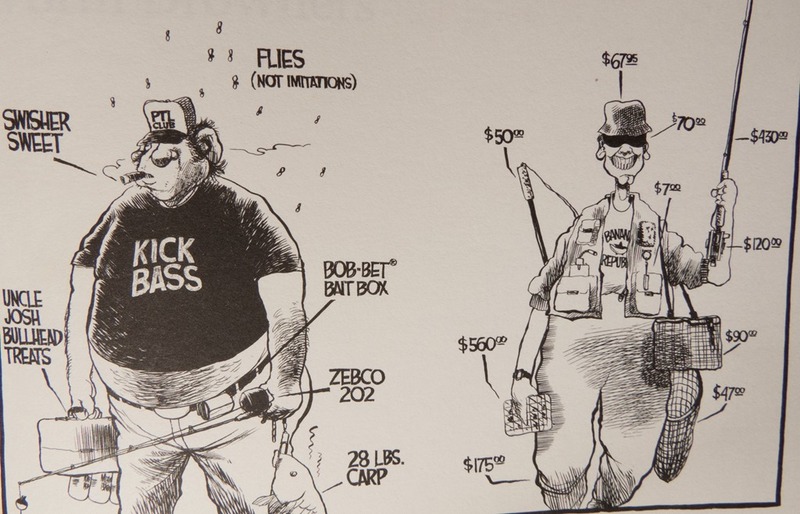 ), but bass eat small Trout too. So to uphold a Trout venue, when it has bass in it, one needs to buy and stock larger Trout (9 to 12 inch stock fish). These larger fish are mighty expensive. 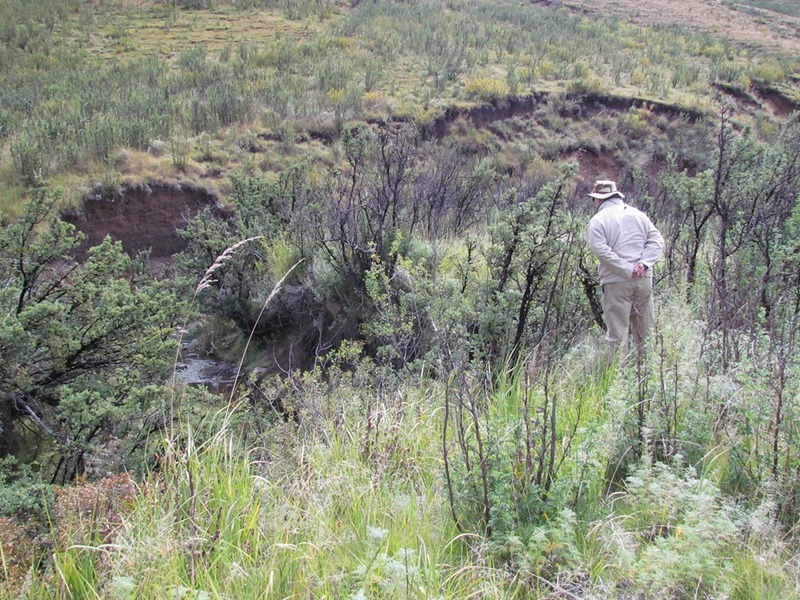 Unless it is a small impoundment, most fishing clubs or lodge owners would drop the stocking of Trout because of the cost, and voila…another Trout water just became a bass water. So how do bass spread, and what, if anything, can be done about the problem? I will make an attempt at this subject in part 2, but for now I wanted the enormity of the problem to sink in. 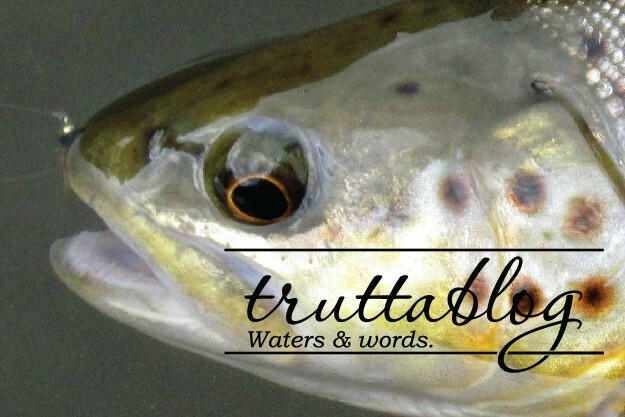 * Yes, Trout are spelled using a capital “T” and bass with a lowercase “b”. This is because I am prejudiced, biased, and unscientific. 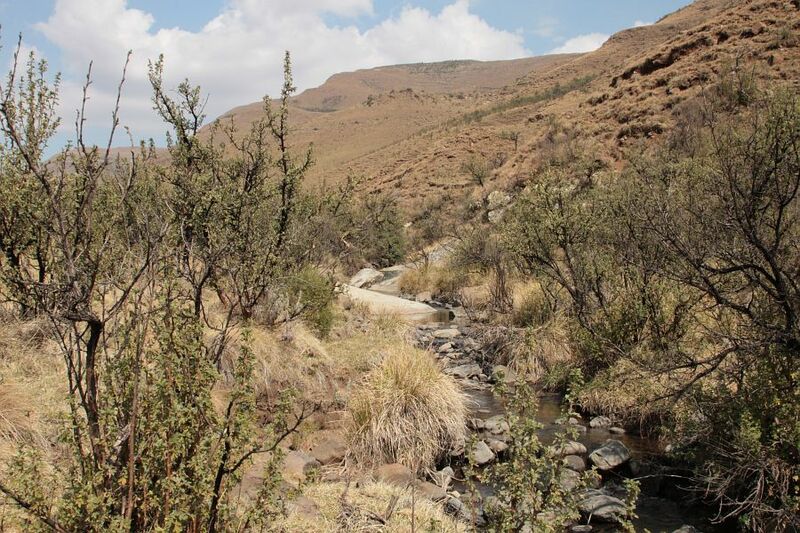 Sitting at home in Maritzburg, Durban, or wherever else one hails from, a flyfisherman is plagued with the problem of not knowing what the Trout waters up there in the hills are looking like. We are still very much in the grip of drought, in that many dams are very low, and rivers have still not had a “spring flush”. 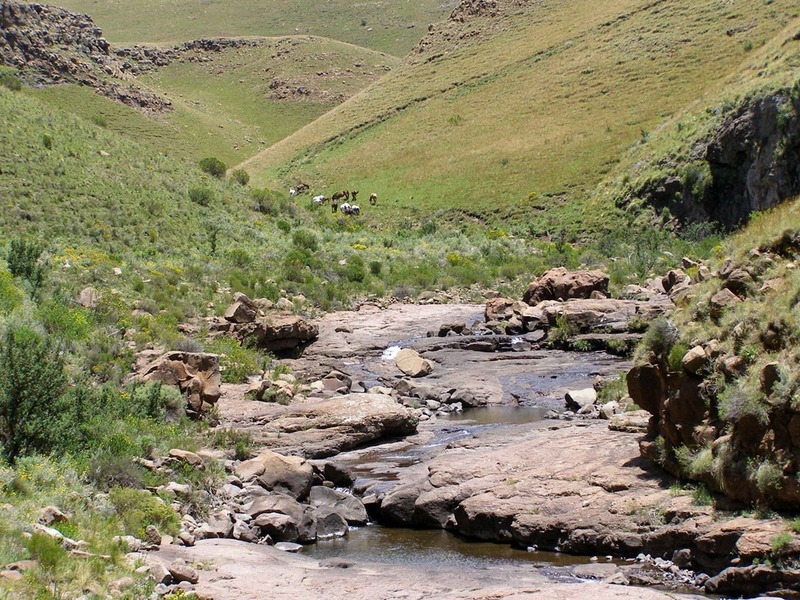 The Mooi at the Bend was at 22.8 degrees C on Thursday morning and flowing at levels that one would expect in winter. The Mooi at Glenfern on Thursday. I would guess it dropped 10mm there, then moved on down over Meshlyn, who I hear got 9mm. 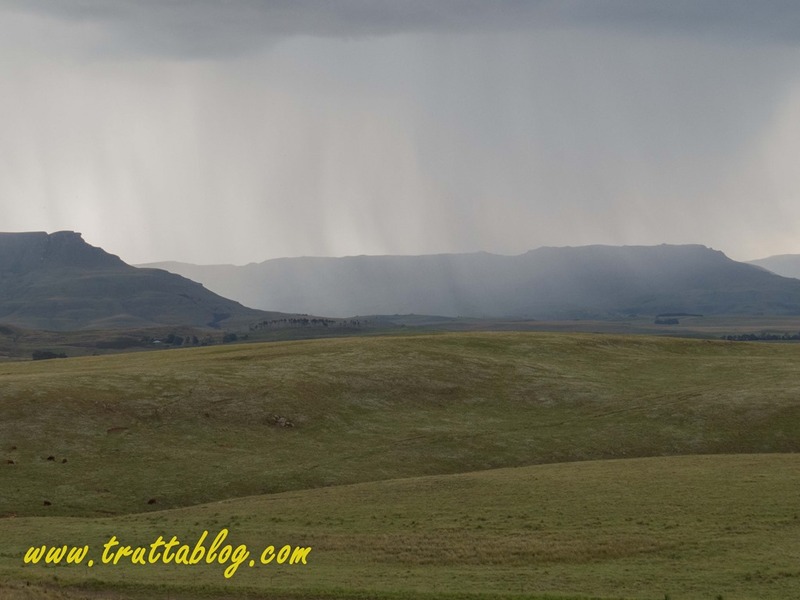 I drove down the valley with the storm, and at about Sourveldt (Kamberg farmers hall), they got pounding rain, wash in the fields, and quite significant runoff into the little Mooi (But a lot less into the lower Mooi). The storm moved out towards Mooi River/Hidcote. On Friday afternoon there were several storms up around the Giant. 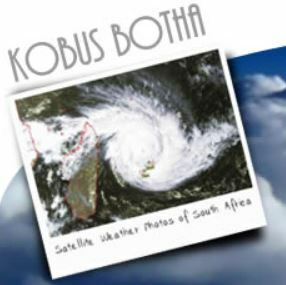 It looked to me that most of the rain fell “below the Giant’s tummy”, and that the Bushmans might therefore have done well from that storm. 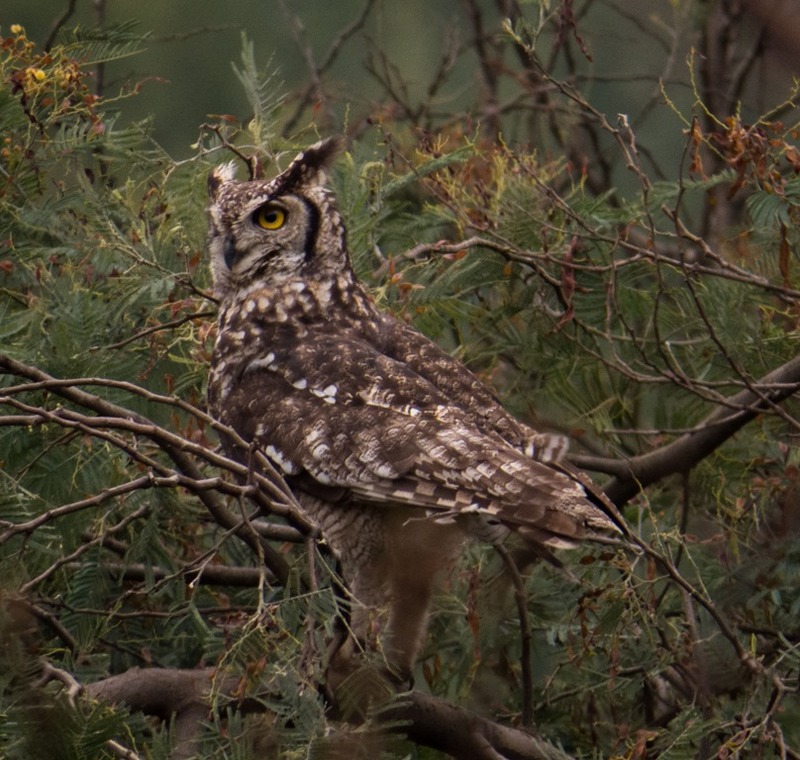 It seemed to move off Northwards and Eastwards towards Ntamahlope. Seconday storms dropped some water over the Giant generally, and I could see scattered rain over the Kamberg Valley. The Mooi at Game pass and at Riverside were definitely up on Saturday, and looking rather pleasant. By that I mean the best they have looked so far this season, and eminently fishable, but there was not enough flow to wash all the algae and silt away. Granchester is similarly low, and I would not bother with Strawberry, Tembu or Eremia. I haven’t seen Uitzicht…but I think you all saw the magnificent fish it produced last week, whatever its level. Highmoor top dam is full and cool. The lower dam is still down a bit. On balance, If I had a day or two more, I would be on the Mooi, at Game Pass, Kamberg, Thendele, Riverside, Stillerus, or Reekie Lyn. I would probably try the Bushmans too. Plenty of good water there. 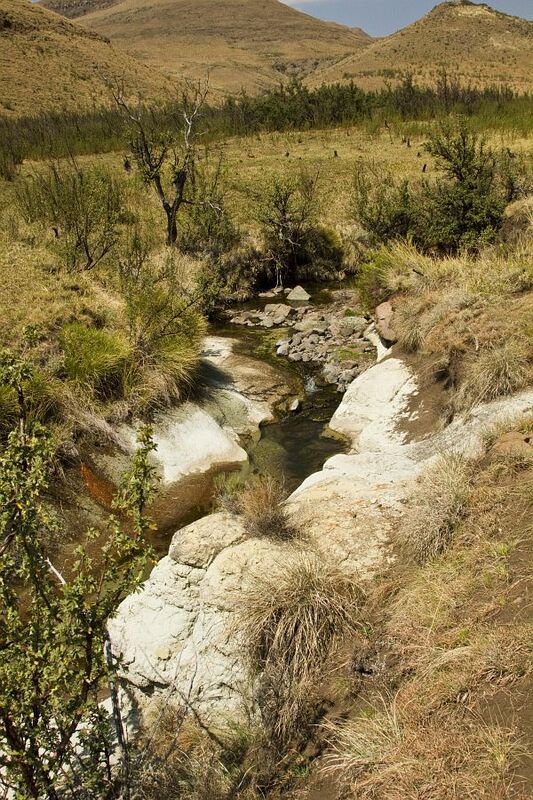 Flows up with some cool mountain water, but running clean. Water at 18 to 20 degrees C. Take suncream and watch out for snakes. Imperfect info, and with the unstable weather we have at this time of year, it might be out of date by this afternoon, but there you have it from my perspective. 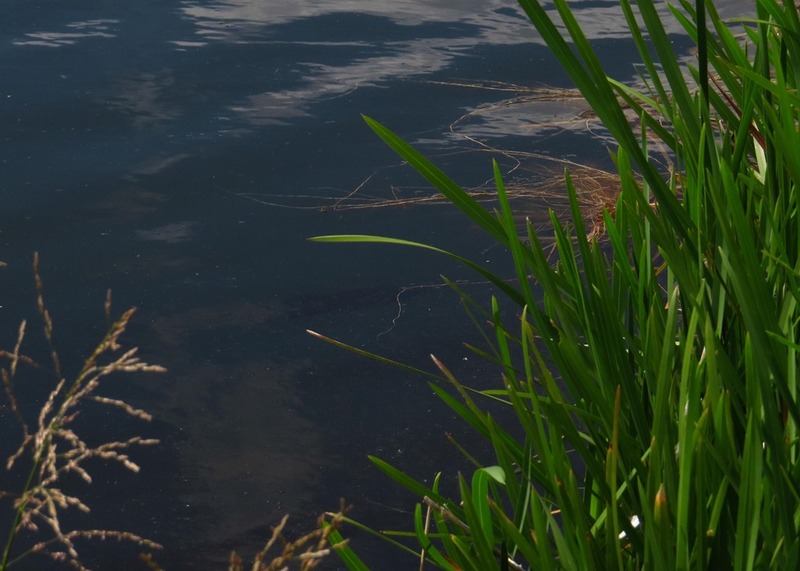 Drop me a line if you have more news on water conditions. 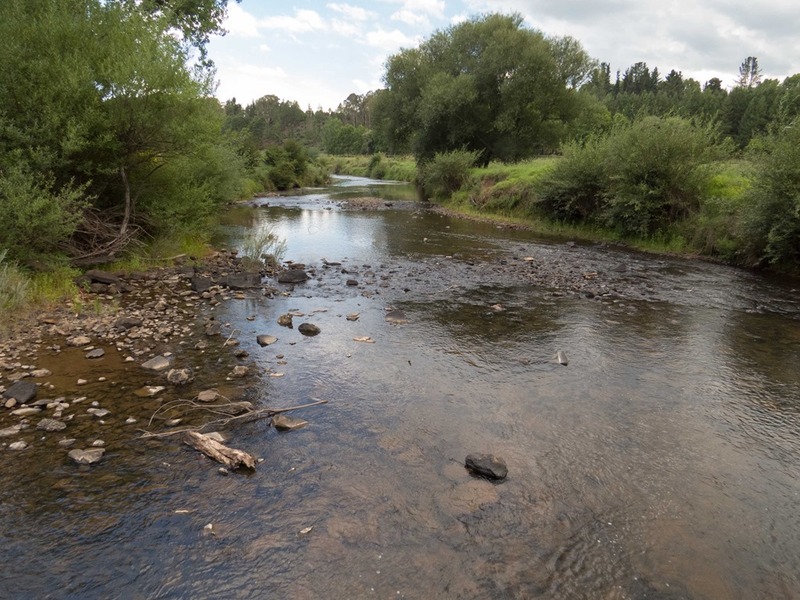 You don’t have to give away your secret spots, or report what you caught, but sharing info on conditions would be a great contribution to our small fly fishing community here in the KZN midlands. For future, I do a more general roundup on this sort of news that you can access from the icons on the right of this. FOSAF report around month end, and a mid-month one on Fly-Dreamers. There is some moon phase and weather stuff on the right too. I hope they add some value. 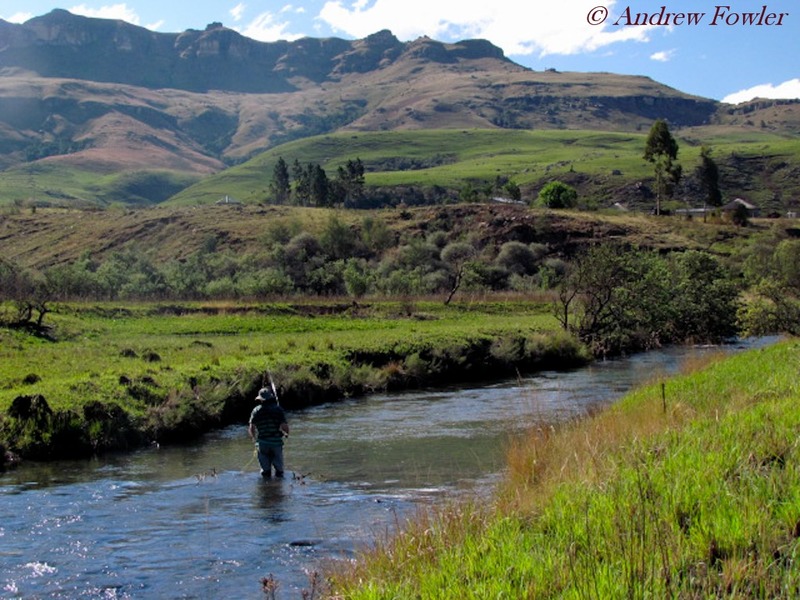 On the last Saturday of September last year, Mike and I headed out to Riverside on the upper Mooi river. 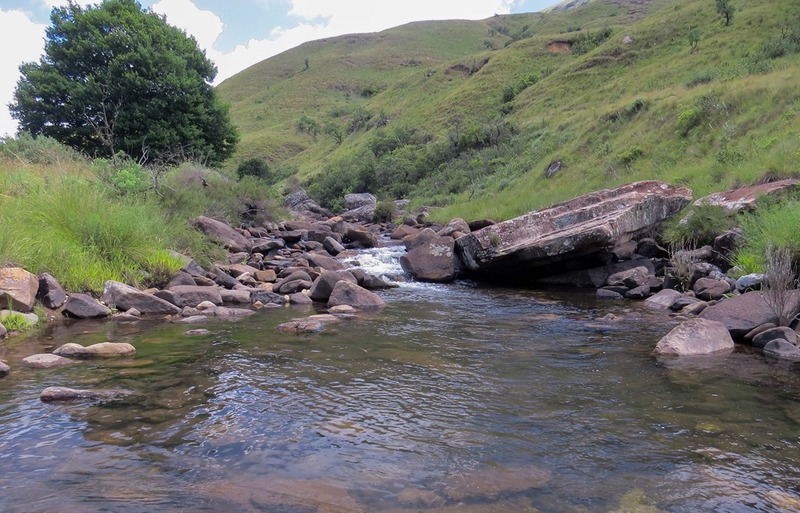 This stretch of river is club water, and is on a dairy farm that sits within the “U” shape formed by the KZN parks area of Kamberg Nature reserve. We were blessed with a pleasant sunny day, the temperature peaking at just twenty two degrees C, and the occasional light gust of wind. 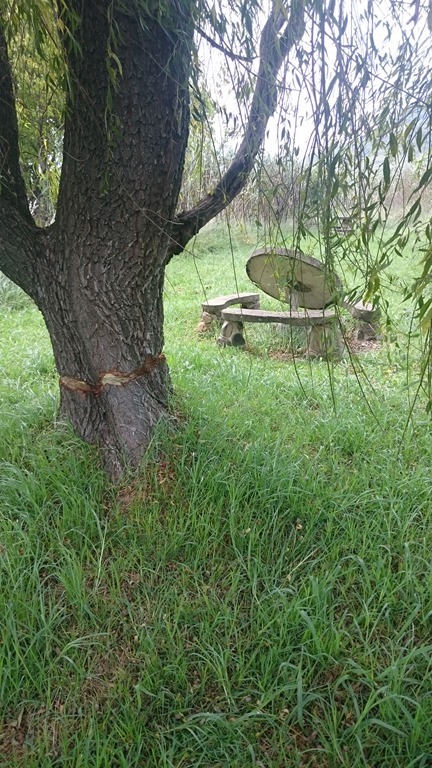 One parks under some plane trees at the farm entrance and fishes upstream from there. This is classic KZN river water for me. Quite high river banks, through which runs a stream, deep and moody in its big pools, and light and babbling over sheets of shelf-rock in other places, with just occasional rapids through a tumble of jagged rocks or rounded pebbles. You generally wade up until it gets too deep, then you clamber out and go around the head of the pool, where you slither down the bank again. In mid summer your forays out of the river involve pushing through grass and maize higher than your head, with the odd fence or bramble bush to keep you on your toes. But in September, while it has turned green, the fields are dusted in short grass, large areas are burned, and the going is really very easy.